Are you looking for a toy or a gift for a 6 month old baby? 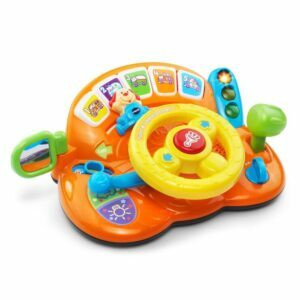 In this review of the best toys for baby boys and girls aged 6 months you will find an array of baby items all age-appropriate, educational and really good fun! For a baby to grow healthy he or she needs the right environment. At six months, what a child is exposed to has a great contribution to the development of the child both physically, mentally and emotionally. It is necessary that they engage in the best activities that will promote their well-being. The people around them matter so much at ensuring the activities the kid does, enhance their development. Toys and games are among the best at ensuring that a newborn develops in a healthy way in all perspectives. They encourage physical, mental and emotional activity for the baby. Toys maximize brain development and enable the child to create imaginations hence develop intellectually. To ensure that this is achieved you need to make a good choice on the toy you buy for your baby. Already, there are many toys for 6 months old babies. 2.0.1 What are the Best Types of Baby Toys? 2.0.2 What Can 6 Month Olds Learn Through Play? 2.0.3 What are the Developmental Milestones at 6 Months Old? Simplicity – The best toy for a six month kid should be simple to operate. Simple toys are also manageable and easy to maintain. Safety – At 6 months, babies like tasting things that they come along so, their toys should be non-toxic to them. They should not also have any risk of injuring the baby. Age – Toys are highly age dependent. As a baby grows they have interest in various toy types. The interest changes as the brain develops. Educational value – Toys for babies should be educative. Baby toys at six months, should stimulate them to start being imaginative and creative. Learning toys for six months old babies are already in the market. Material – Best toys at six months should have a fine texture. They are expected to be smooth and baby friendly. One of the best toys for a 6 months old baby is Baby Einstein. It provides many engaging activities for your young one. 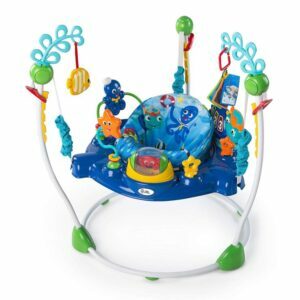 It provides the baby with an awesome experience in water as it comes with an underwater splash. It has a baby chair that is diverse as allows it to do different activities like bouncing, dancing and jumping in the water which is physical exercises. Other playing toys that come with it are fabulous! 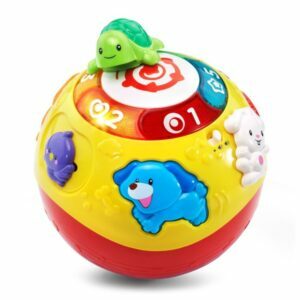 They include crab, octopus paddle, a starfish with a mirror, and a replaceable sea turtle toy in the middle that has numbers, colors and 3 languages. This gives your baby entertainment and discovery at the same time. All this is to ensure that the kid is happy. The toy is electrical and easy to operate. 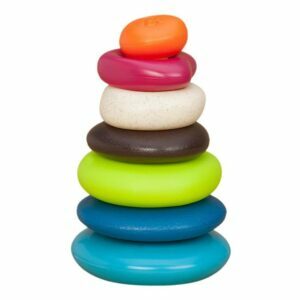 This is a learning, sensory, nature design, and a fun toy made of five rings of different sizes and colours that a child stacks them in any order. For the sensory purpose, a child can arrange the rings, chew them as they are squeezable and nontoxic. It is a good toy for baby development, especially in creative activities. The kid is able to make new arrangements on their own. It also helps a child to learn to differentiate colours, learn technical skills and maintenance of eye contact when the baby play with it. It is designed to bring soothing art inspirations which relates to rings stacking. For fun, a child can wear the rings after stacking them or put them on the head and try to balance them. The toy is made of a very fine and baby friendly material that is safe for your kid. It is a perfect toy for babies between 6 months and 3 years. The baby trend is one of the best gifts for 6 months old kid in preparation for the near future when the kid will start walking. It has multi-directional wheels that allow movement in any direction. 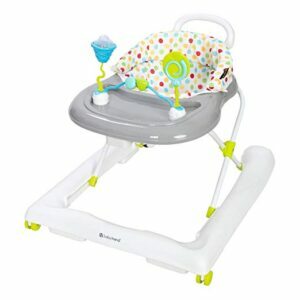 It also has a spacious base that gives ultimate support on the ground; this instills self-confidence in the baby. At the back, it has a walk behind bar for the baby after it has advanced from new terrain. The toy also has a large tray where the kid can place other toys or food. It can be used over time as the baby grows since the size is adjustable and easy to store as it folds flat. The toy does not need electricity or a battery to operate. It is one of the perfect learning toys in the market. The toy is meant to keep your baby happy and ensure that they grow strong and healthy. It is the best 6 months old baby toy that promotes muscle and brain development, social and fine motor skills. It is made of water and air proof heavy duty material. With it, you are assured that your baby will develop strong muscles and will require less assistance where physical strength is needed. The toy has bright coloured graphics that is appealing to the eyes which also helps in visual stimulations. In addition, it has floating toys that the baby will have fun trying to catch them. It can be easily carried as it folds. 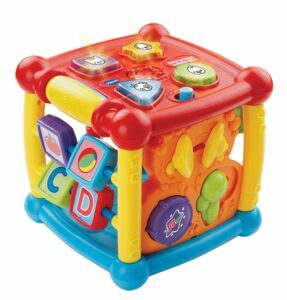 Best toy for 6 months old-activity cube. It has five sides that a child can navigate through. Each side has buttons that produce sounds, names, and shapes when pressed. 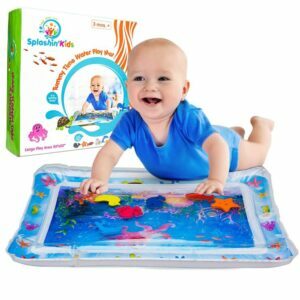 It also comes with other interactive features that enhance the baby motor activities as he or she will try to sit up or crawl towards it to touch them to produces playful music that comes with it. This keeps them busy and entertained at the same time. The cube is fantastic especially for busy people who cannot stay long with their 6 month kid. The cube makes the kids brain active and more creative because of the fine motor activities they engage in. This is one of the best learning toys for your six months kid as it is a play and crawl toy. It is around this age that the baby starts to crawl. To encourage this, you need a Vtech wiggle and crawl toy. It is a spherical toy that your child can spin and learn a lot from it. It has graphics and pictures of pets that produce their sound on pressing them which also enhances fine motor skills. This helps your kid not only grow physically but also mentally. The kid can learn the names of pets, colours, and even numbers. The toy is good in that it can play melodies to keep your kid happy and flashlight to draw attention. It is the best educational toy for 6 months old kid. Most babies learn to sit down between 4 and 7 months. To support your kid perfectly on this you need a Fisher Price Seat- Me-Up toy. 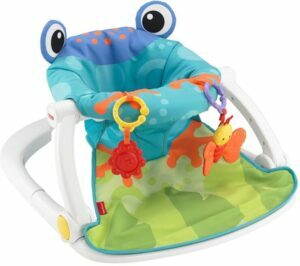 It has a froggy design seat that is soft, wide, upright and supportive. It is made in a way that allows the child to see all that is happening around them. It comes with two toys that keep the baby busy while seated on them. The seat pad can be removed and the device cleaned. It is one of the best baby toys for 6 months old kid. Another advantage is that the toy is portable therefore you can use it anywhere. The toy is made of high-quality fine linen that is durable. This is a perfect gift toy for a six month old baby boy because it is around this time when he or she is learning to crawl and start walking. The toy encourages the baby to crawl, sit up, stand up and even walk around if they can. It comes with other stationaries that produces lights sounds and about 75 songs that will encourage all this. It is also installed with other development stages technologies that allow you to change them to another advanced level according to the rate of your baby growth. It can be used up to the age of three years. It promotes the necessary physical activities that enhance healthy growth and development of the various organs especially the arms and legs. 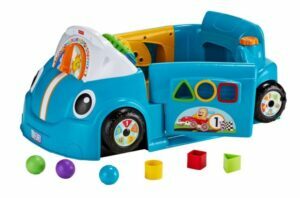 The toy car designs such that it also enhances creative thinking and imagination thus, help the kid grow intellectually. 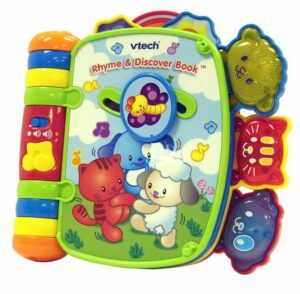 This is the best toy to help your baby develop language as it has four delightful nursery rhythms. The device is actually colourful and has 4 movable pieces. It is easy to operate for a 6 months kid. It helps the baby learn new words and hence considered the most educational 6 months baby toy. The toy plays melodies for the baby thus making them happy. It is also asking an open-ended question that makes the baby think. It can serve as a good start for developing talent. This is very delightful for the child as learning language is now intertwined with leisure. This lays a good foundation for effective communication skills and helps improve linguistic memory. It is a wonderful bowl toy to give your baby an aquatic imagination as it comes with bold and colourful sea creatures. It is a very beautiful toy with fine texture. It makes pleasant melodies for your baby and hence makes the kid joyous. 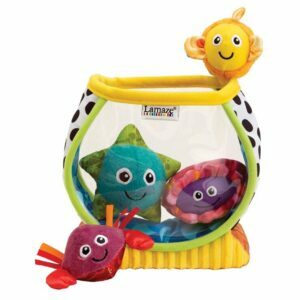 The Lamaze Fishbowl is highly durable made of polyester. It requires no batteries. The bowl comes with several other toys that will keep the baby busy. It makes the baby active both mentally and physically as he or she tries to come up with new arrangements and patterns hence making a game for the baby to play. This helps in learning fine movements and improves visual focus. 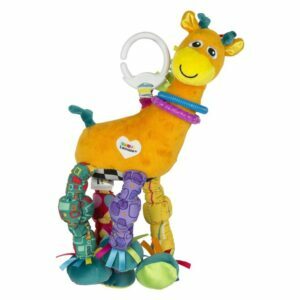 The Lamaze stretch the giraffe toy keeps your kid happy all through. It is a gorgeous toy meant to keep your kid busy and active. It improves the imagination of the kid as they will try exploring its well knotted, crinkles legs. It entertains the kid by produces some sounds when pulled on the nose or legs. Stimulates the baby to think about wild animals and nature which prepares him or her on what is in the real world. It helps improve colour identity as it is made of bright colours. Sometimes it is the source of game and can be used to determine whether the kid has affection to animals. It comes with a clip that can be used to attach it on a stroller or baby bag. This is a spinning wheel toy made of several rings and many brightly coloured beads that produces pleasant sound for the kid and for visual stimulation. It makes the kids brain active as they can connect the sound with the coloured beads .Kids like playing with these beads so much. 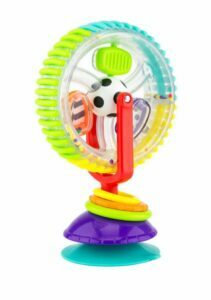 It is an excellent toy for six months old baby since it can easily capture their attention by a single spin. The toy stimulate the kid to develop new arrangements hence improve creativity. Also can be used to learn numbering and improve fine motor skills. It also has several texture points that the baby can explore. The toy is safe for your kid to use. The wonder Wheel Activity Centre is easy to maintain and do not require power or battery to operate. The most amazing toy is Baby Einstein Jumper. A child has a chance to play with water and aquatic animal toys. Seems to give much pleasure and is an active activity meaning that the kid will physically and mentally develop and grow. It is an awesome toy to have your baby play with aquatic toys in water. What are the Best Types of Baby Toys? The best type of toys for kids is those that keep them busy and engaged. Toys should provide a game for the kid to play. The best toys should attract attention and have bright colours. They should also be simple for the kid to handle. They are the ones made of fine material – one that cannot injure the baby. Best toys should also have NO toxicity since children like eating/tasting things that come along their way. Sometimes the type of toys is dependent on gender. For example, young boys like cars while young ladies like dolls. 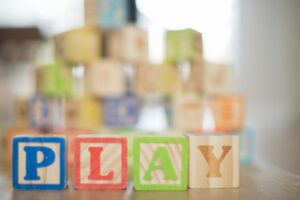 What Can 6 Month Olds Learn Through Play? What are the Developmental Milestones at 6 Months Old? • Emotion development also begins at this level. At six months is when the kid starts doing what he/she has been observing. This is the time the kid will be learning how to sit up on their own. At this stage, the kid is likely to try to raise up their legs and arms. Though may not be successful at times. This is the age when the child starts to utter simple words. The words may not be making sense to us but at least the kid tries to talk. The likes of ba-ba and ta-ta-ta .At six months is when the baby starts to ingest solid foods or other solid stuff since they do not actually what is right to be eaten.